The PLA already contests maritime Asia with the United States. Korea-based magazine Global Asia is back with an issue on the geopolitics of Asia. Featured are articles from well-known commentators such as Boston College professor Robert Ross and diplomatic historian extraordinaire Walter Russell Mead. It’s a refreshing read for anyone fascinated by the bareknuckles interactions that ensue when political calculations meet human passions meet geographic facts of life. The Naval Diplomat was jazzed after browsing through. But (And you knew a but was coming) let me zero in on Professor Ross, who lodges several misleading claims in his tour d’horizon of geopolitical competition in Asia. For one, he starts a discussion of naval trends in the region by contending that the “Chinese Navy cannot yet challenge the U.S. in maritime East Asia.” Really? The People’s Liberation Army, including its seagoing arm, has been mounting a challenge against the U.S. Navy for some years now. It clearly can if it already is. Whether its challenge will succeed remains to be determined. Either way, long-term strategic competition has been joined. 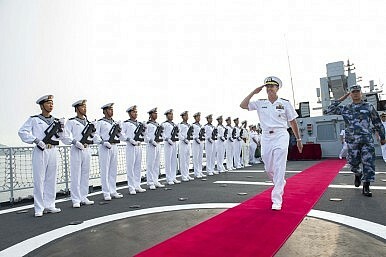 Now, it may be that Chinese sea power—meaning not just the PLA Navy but the shore-based component of Chinese maritime strategy, manifest in land-based anti-ship missiles and tactical aircraft flying from airfields ashore—cannot yet defeat the American naval contingent forward-deployed to Asia in a pitched battle. In a sense, though, that’s beside the point. Four decades back Edward Luttwak affirmed that peacetime “naval suasion” is more about optics than slugging it out with enemy fleets. It’s about displaying ships, warplanes, and armaments in a manner that convinces important audiences your navy would triumph in combat on the high seas. Armed suasion, then, is about managing perceptions. Physical implements are implements of political discourse. In other words, writes Luttwak, whoever a critical mass of observers thinks would have won an actual battle does win in peacetime encounters, where rival forces face off without actually exchanging fire. Appearances sway observers one way or the other. Perception is king. Outwardly impressive ships, aircraft, and weaponry can make an outsized impression on lay audiences—potentially skewing the results of a peacetime showdown in favor of the lesser contender. To wit, China. Should China’s navy square off against America’s, moreover, it could prevail by threatening to do massive damage—even in a losing cause. Think about it. Washington is finding it hard to keep up the U.S. Navy’s size—even in a peacetime setting, when ships aren’t being disabled or sunk. What if the fleet suffered heavy losses in combat, and had to replace lost ships, aircraft, and munitions afterward? How much of its navy can America lose and remain a superpower? How fast could the navy regenerate strength, and where would the extra money come from? If U.S. leaders were asking themselves such questions going in, they might hesitate at a critical moment—or forego a worthy effort altogether. That’s deterrence, and a way a weaker foe can successfully challenge the strong. So much for the PLA’s being utterly outclassed at sea. Bottom line, let’s not succumb to hubris. Now on to tactical and force-structure matters. Nitpicking, you say? Nope. As strategic big kahuna Carl von Clausewitz vouchsafed two centuries ago, it takes resounding tactical success to yield resounding strategic success. Getting hardware and tactics wrong, conversely, can confound strategy and geopolitics. So the technical dimension is worth belaboring. Ross maintains that “China has yet to develop an anti-ship ballistic missile capability, which may ultimately be unachievable.” The PLA hasn’t developed an ASBM? Why, yes, it has. Now, whether PLA rocketeers have made that bird into a working implement of war remains an open question four years after it reached initial operating capability. Best we know, the ASBM has yet to undergo testing under battle conditions. That shortfall indeed casts doubt on its efficacy. But dismissing the ASBM outright is premature—which is why the Pentagon’s annual reports on Chinese military power routinely draw attention to it, and why U.S. Navy mariners fret about it. Next, Ross claims that the PLA Navy’s submarine force is “quite small” relative to the U.S. Navy’s. Quite small? By what standard? The naval balance is a relative thing, and your opponent is the yardstick. GlobalSecurity.org projects that China will field 70 subs in 2020, 63 of them nuclear or diesel attack boats. That number will remain on the upswing if recent history is any indication. And the PLA Navy is fast ridding itself of noisy, obsolescent Cold War-vintage junk as it modernizes. The U.S. Navy, by contrast, fields 73 submarines today. Imposing, eh? Of that total, though, 18 are Ohio-class boats. Of those, 14 “boomers,” or ballistic-missiles subs, comprise the undersea leg of the nation’s nuclear deterrent. The remaining 4 have been fitted with large numbers of Tomahawk cruise missiles for land-attack missions. The Ohios are not platforms that fight for maritime command. Subtracting them from the total leaves the U.S. Navy with 55 nuclear-powered attack submarines, or SSNs. But wait. Only about 33 boats, or 60 percent of the U.S. sub fleet, call the Asia-Pacific home under the Obama administration’s pivot to Asia. Meanwhile, the entire PLA Navy sub force is concentrated in the region (with the exception of one diesel boat currently plying the Indian Ocean). And it’s concentrated in a subset of that region, mainly the China seas. As it turns out, then, Ross’s “quite small” Chinese fleet outnumbers the U.S. Pacific Fleet sub force by a wide margin in the waters that count—already. That brute numerical disparity will widen. The American fleet is set to dwindle as low as 42 by the mid-2020s as shipbuilding budgets flatline—at best—while construction costs rise. And it gets worse. The 2020s is a decade when new-construction ballistic-missile subs—replacements for the Ohio class—threaten to crowd out not just SSN construction but all other navy programs. Amphibian pundit CDR Salamander dubs this looming acquisition debacle the Terrible Twenties. Ergo, it’s doubtful SSN numbers will recover any time soon. Do the math: in 2025 or thereabouts—assuming the pivot remains in force, and with it the mandate to allocate 60 percent of naval forces to the Pacific Fleet—the U.S. Navy will deploy 25 or 26 subs to face off against upwards of 60 Chinese diesel and nuclear attack boats. But even those figures project an optimistic view of the undersea balance, since they rest on the dubious assumption that Washington will concentrate the entire Pacific sub force in East Asia—neglecting important expanses such as the Indian Ocean and Eastern Pacific. The mismatch in numbers is likely to persist and grow. If China possesses a small undersea force, what does Ross consider a big one? But aren’t American SSNs virtually omnipotent? Yes and no. Yes, once they close to weapons range. No, because they have to get close to fire. U.S. Navy boats rely on torpedoes to assail enemy shipping. That means they need to approach within roughly 10 nautical miles of their prey. Sketch a circle on the map with a 20-mile diameter centered on a hypothetical sub’s position, and you’ll see that’s not a lot of geographic coverage per boat. American SSNs can launch cruise missiles, to be sure, but their Tomahawks are for hitting targets ashore, not enemy surface fleets. Fighting for control of the sea is a relative afterthought. U.S. boats’ Chinese counterparts, by contrast, are armed not just with torpedoes but with anti-ship cruise missiles—weapons capable of pummeling surface ships scores of miles away. That’s what you call reach. The true picture, in short, is far blurrier than the one Ross paints. Beijing fields inferior boats. But it fields lots of them, and it has the luxury of massing the whole fleet in the China seas and Western Pacific while its rival scatters assets throughout the seven seas. The competitor that can hurl its entire armed might against a fraction of its opponent’s commands a distinct advantage. Advantage: China. So how does the balance work out in Asia? It’s tough to say. What’s not tough to say is this: blithely discounting a rising competitor’s skill, ingenuity, and élan represents a mistake of the first order—and a mistake to which established powers appear acutely prone. Americans should refuse to let triumphalism about submarine warfare—or any other combat domain—color their geopolitical judgments. China is a serious competitor boasting serious capability. And it could get its way. Clausewitz lists three ways one antagonist can prevail over another in war. One combatant can defeat the other militarily and impose terms. That’s the obvious way: crush your enemy, see him driven before you, and hear the lamentations of the women! The other two methods apply to peacetime strategic competition as well. They involve playing head games with opponents. Beijing excels at head games. If a combatant can dishearten its opponent—say, by mounting an impressive show of force at a well-chosen place and time—it can win by default. Or if it can ratchet up the price of victory higher than the opponent is willing to pay—by threatening to inflict heavy damage, or to string out the enterprise without end, or to otherwise sap his resources—cost/benefit logic should prompt that opponent to stand down. The weak, then, can overcome the strong. They have done so many times in history. China doesn’t relish a test of arms. What sane government does? But it enjoys far more options and far greater prospects of success than Professor Ross allows. Let’s give China’s military and its political overseers their due.